Save the Date! Join us for the 3rd anniversary of Obtainium Works! Come help us celebrate our 3rd Annual St. Patrick's Day in Vallejo! We will be having corned beef sandwiches, baked potato bar, salads, hórs doevres, dessert and special drinks served by robots! $20/per person donation includes the meal and1 drink; $5 drinks for purchase. Entertainment by our own DJ, Grego; Litz Plummer, the SF Opera Lady; and many others! A humorous cartoon by Shannon O'Hare. The patron Irish saint encounters the Old One. We seem to be obsessed with the Lovecraftian creature. Come to our annual wacky parade of eccentrics and city pride on December 7th. The Fourth annual parade has become a huge event in the city of Vallejo and is fun for the whole family! Click here for details! 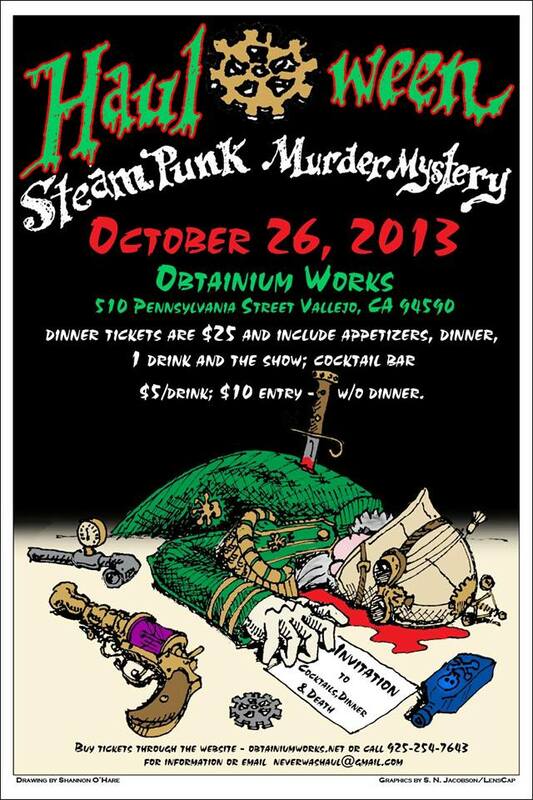 Join in the Haul-o-ween murder mystery dinner on October 26th and find out who killed the Major! Click here to find out more! Date: October 5th, 6-10pm Location: Downtown Vallejo, CAWebsite: http://www.vallejoartwindows.com/home.htmlVallejo Art Windows, a temporary, annual, site-specific art program to be held on Saturday, October 5, 2012. The Vallejo Art Windows exhibition launch will kick off around nightfall in historic Downtown Vallejo, where guests will be able to tour the installation windows following their official lighting. The launch event will also include a fundraiser for VCAF, A Vallejo arts organization and whose programs serve the Vallejo community and The Hub a new community art center in downtown. Artists will be on hand to talk about the artwork. Each Sunday from 12 noon until 6:00 pm are work days and open house! Come by and get dirty! Learn new skills, help clean up the shop, meet the crew! The Obtainium Works crew spent nearly two weeks (Aug 23-Sept 2) in the Black Rock desert cavorting in the art car paradise that is Burning Man! We are home safe and (mostly) sound. It's going to take a few weeks to clean the playa dust out of our ears and off of the Neverwas Haul. During the Burn, we had several celebrity guests enjoy the hospitality of our fine home: Author Cory Doctorow, Steampunk Inventor Jack Von Slatt, and famous photographer Trey Ratcliff! Also, "Vintage Tomorrows" author James Carrott joined us all week as crew. The Final Public Map and Race info flyer is online!Click here to see on the Obtainium Cup website! APPLICATION DEADLINE EXTENDED to JULY 21!Sign up here! Look out for the flying monkeys! Ride away from the zombies! Maneuver around marauding Mad Hatters! The second installment of the Obtainium Cup is coming with more wackiness than ever before! Bring your bicycles, art cars, art bikes, fancy costume, and lots of silliness. Click here to see the Obtainium Cup website for details. For constant updates, please follow our Facebook page. Starting point: Meet at the corner of Georgia and Sonoma Blvd. Join Obtainium Works for a costume parade through downtown Vallejo. We will end up at the Northern California Pirate Festival at the shoreline park near the Vallejo Ferry Terminal. Dress in your favorite pirate gear! The first 25 folks who participate in the parade get into the Pirate Festival for free! Come see Islas, the Mechanical Horse at the MAKER Faire. It's a life-size Hobby Horse designed by Shannon O'Hare and built by the Obtainium Works crew. Visit the Steampunk Grotto and purchase goggles, jewelry, clothing, pins, hats with fellow people who like to wear tweed in hot weather. The earliest reports of a creature date back to before the first Europeans in California in the seventeenth century when a tribe of Miwok native Americans sighted a large serpent swimming up the channel past Mare Island. Chief Estanislao spoke of an ancient tale of a sea serpent that was sick of living in the sea. It would come ashore annually during the high tides around the spring Equinox to find a home in fresh water. Settlers thought it was merely a myth, but over the years many people saw something which had entered from the Solano river via Rindler creek and had taken up residence in the lake. In 1849 Padre Francisco Juarez, believing the creature to be an evil spirit, went out into the lake in a small canoe to exorcise the demon. Upon seeing the immense creature, he fell into the water and nearly drown. He was saved by the creature, which fished him out and brought him safely back to dry land. When he woke on the shore, the creature was gone. Juarez later quit his Mission and became a prospector up in the Sierra Mountains, vowing to never swim again. In 1937, while bird watching with his box brownie camera, naturalist George Ellis noticed a disturbance in the water near the shore. He managed to snap the only known photograph of the creature. He proceeded to drop his camera and damage it beyond repair. The photographic plate was developed and there is clearly an object visible at some distance. It appears to be a long neck and head protruding from the water. In 1944, while performing top secret sonar tests off the coast of Mare Island, the USS Redfin encountered a large unidentified underwater object which brushed against the hull. Upon surfacing, the crew heard a loud bellowing noise at almost the same frequency as the sonar pings. Chief James “Smiley” McKevitt reported that a “long necked creature, resembling a plesiosaur proceeded to give the conning tower a ‘love bite’ before diving again.” The matter was kept quiet and all those on duty were sworn to secrecy. May 15, 1969 at approximately 8:30pm, the nuclear powered submarine Guitarro sank while tied to the dock at the Mare Naval Shipyard. A loud “bouncing noise” was heard before the sub sank into the channel with its hatches open during repairs. No one was aboard at the time and no injuries were reported. Guards witnessed a “large dark shape moving through the water heading north.” One ensign said that he thought it might have been “a whale with a long neck.” The incident was ruled an accident. The matter was classified and no further details were released. Marine World’s much loved water ski shows came to an abrupt end after an incident involving an unseen object in the water acted like an underwater ramp and prematurely launched a pyramid of skiers into the air. “It was really a surprise, I thought it was part of the show and I’d just missed a rehearsal or something” said Becky Barbatta. No one was hurt but the remaining shows were cancelled. Park officials refused to comment on the rumors of a run in with the creature. Witnesses felt that if there was a creature in the lake, it was simply playing around. November 15th 2012 two men, fishing for trout from a dock in Chabot Lake, claimed to have seen “a monster” that appeared to be “like a dragon” or “kinda like a dinosaur.” The creature supposedly surfaced near them and helped itself to the bucket of fish the men had caught, as well as their case of beer. “It made a noise like a fog horn” or “a whale farting” said one of the men. They reported this to a police officer in a passing patrol car. Since neither man had a fishing license and both were extremely intoxicated, their story was not taken seriously. They were then arrested for public drunkenness and violation of the State’s fish and game regulations. They wished their names to be kept anonymous due to the ridicule they have received about this incident. The Traveling Academy of Unnatural Sciences, based out of Obtainium Works in Vallejo, CA believe there still may be a large aquatic creature living in Lake Chabot, Vallejo, CA. They are investigating recent sightings of the unknown cryptid to determine if there is any validity to these claims. They have dealt with this sort of crypto-zoological phenomenon in the past. There is a distinct possibility that there may be a harmless unknown species of vertebrate living in the lake, feeding on the lake’s well stocked supply of rainbow trout. It is possible that some amphibious sea creature may have been drawn to the lake by the ultrasonic calls of the incarcerated cetaceans and marine mammals in the nearby theme park. Perhaps? Even the oddest myths tend to have some basis in truth. Yea, you know the routine. Obtainium Cup Contraptor's Rally! July 21, 2013 on Mare Island. One Year Anniversary! March 17, 2013! We're going to celebrate our 1 year anniversary at Obtainium Works in Vallejo on Sunday, March 17 (St. Patrick's Day, of course!) from 4pm until the leprechauns chase us out. Bring a side dish, dessert and drinks - we'll provide the corned beef and cabbage! Musicians - bring instruments and we'll have canned music if you can't make it. RSVP to neverwashaul@gmail.com for details and directions. What: A wacky twist on the traditional Christmas parade! The Mad Hatter Holiday Festival will not only include local civic leaders riding fancy cars down the streets of Vallejo, but it will also be a full on Burning Man art car parade! In full Christmas dress! Burners being festive! Locals being amazed! Flame throwers! Strange looking vehicles! Goofy Alice in Wonderland-themed costumes and contraptions! Plus, we have a Ball with live music from acoustic acts like the Hobo Goblins! Vendors selling nifty Steampunk items! Come one, come all! September 29: The first ever Obtainium Cup! Trial run for a new type of kinetic art car race. September 12: The Neverwas crew attends the premiere of "Vintage Tomorrows," an in depth documentary of the Steampunk movement. 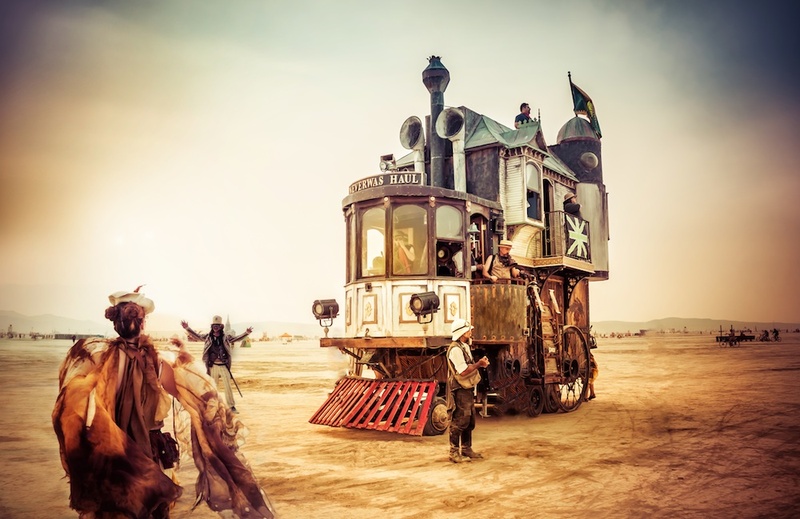 August 27–September 3: BURNING MAN! The Haul returns to the playa. July 21, 2012: The Grand Wedding of Dr. Professor Samuel Tweed and Katherine the Great! An event of epic proportions! March 15, 2012: Obtainium Works Grand Opening.